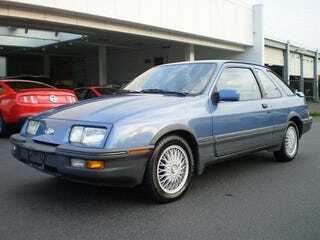 1988 Merkur XR4Ti for a Euro-Trashy $5,775! Historically X marks the spot, however Ford seemed to miss the target with their mid-eighties imports. Today, Nice Price or Crack Pipe wants to know if time has improved the perception of their aim. Yesterday you provided a pinto with a plethora of positive platitudes proving that performance pulverizes picayune pedigree. Today, we're going to visit Ellis Island. Find Out Why the Caged Pinto Sings for Only $4,500! The Ford Motor Company has been a global auto maker for nearly 100 years, and their vehicles built and sold outside the U.S. were eventually designed to conform to the needs of those specific markets. The Blue Oval company has also had a long history of bringing these foreign-Fords to the U.S. in an attempt to fill a supposed market niche. Some were more successful than others- the Mercury Capri being a notable example. Others, such as the Cortina, Fiesta, and Australian Capri convertible were less so, and most of these exchange students have been orphaned by their host family in Dearborn, who turn out the lights and refuse to answer the door when they come a knocking. In the mid-eighties, Ford decided to not only bring over one of their most popular and award-winning models from Europe, but to create a spankin' new brand under which to sell them. Sadly, Ford chose to name the germanic brand the same as that of custodial parent Mercury, only in its native Deutsch, thus birthing Merkur . This proved nearly unpronounceable by the vast majority of Mercury sales people, condemning the cars to being called Merkers, murkurs, murkins, or worse. The appellation confusion was only exacerbated by the jelly-bean shape and unique detailing, highlighted by the double rear wing and a third side window that seemed to serve no purpose but to piss people off by its mere presence. The XR4Ti was based on the hottest version of Ford's European Cortina replacement, the Sierra, which had been winning accolades since its introduction. Powered in the U.S. by the sturdy 2.3 Turbo from the Mustang and T-Bird, the car brought sophistication and driving dynamics beyond anything Ford offered to domestic buyers at the time. Unfortunately, the weird overwhelmed the wonderful, and, in the face of impending safety requirements, the XR4Ti, along with its Scorpio big brother, were sent back to home country when their visas ran out in 1989. But that was not before this metallic blue ‘88 hit our shores. Turning down the weird a bit, this car has the later single plane rear spoiler, but maintains the two-tone appearance with unpainted plastic cladding and bumpers. Built in Cologne, and modded for the U.S. market (700 changes!) by Karmann, the 3 door has all the attributes for success in Europe, and for failure in the U.S.. Hatchbacks, especially large ones, have never been popular here. Small, turbo four cylinders were shunned for their torquier and less efficient V8 counterparts- as evidenced by the buyer's choices of cousin Mustang models. Based on these factors, unfavorable exchange rates, and marketing that seemed half-assed at best, the XR4Ti never really caught on here, and even the buff mags began to diss the car despite initial praise. But look at those specs- 130 mph top end, trailing arm IRS, roomy five seat leather-swathed cabin, slick T9 gearbox, and a 175 bhp turbo four that's pretty bullet-proof. What's not to love? And it could be yours for $5,775. The seller isn't too forthcoming with the facts on the car, other than that it's a one-owner car with only 85K on the clock. That's only about 4,000 miles a year, and other than the typical wear on the driver's seat bolster, the car looks pretty tidy. So, would you pay close to six large for an athletic German orphan? Or, does that price make you say XR4T-I don't think so? eBayerische or go here if the ad makes like schnell.